Far infrared heaters, on the other hand, are heated by metallic or ceramic elements that emit a narrow spectrum of mainly far infrared energy. They were introduced in the early 1980’s and use radiant energy that heats the body from the inside as well as the surface. Research shows that the infrared can penetrate about 3.5 - 4 cm into the body and for this reason they get great results at much lower temperatures. Not only is the cooler temperature more comfortable for people, but far infrared also cleanses the tissues more effectively. The heat is not just effective for bacteria die-off (by creating an artificial fever), but has a whole host of other detoxification effects, as it allows the skin to detoxify toxins, including heavy metals, more effectively, essentially taking pressure off the internal detoxification organs. 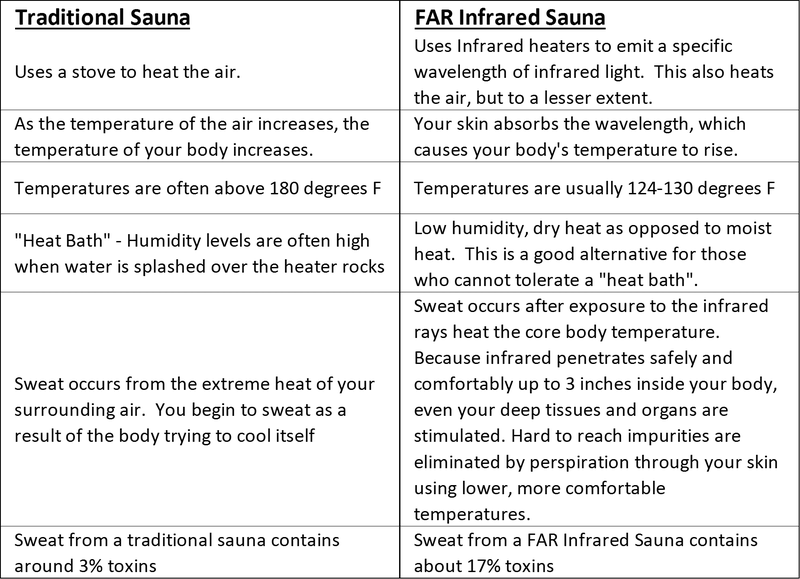 In many infrared saunas, there is the option to turn on the colour therapy, which is an ancient and often highly effective healing modality. Different spectrum of light provide different healing qualities, including nourishment of vital organs, emotional release and the movement of chi/vital energy from the head down the body, where we are often deficient, to improve healing capacity.